There are very few people around who have been associated with bigfoots for as long as Al Hodgson has been. Mr. Hodgson investigated footprint finds as early as August of 1963 when he and Betty Allen cast prints near Bluff Creek. Mr. Hodgson gave Ms. Allen a lift to see the footprints which he told me were the first prints he had ever seen in the ground. He went on to say that the prints convinced him there really was something to this "bigfoot" thing. 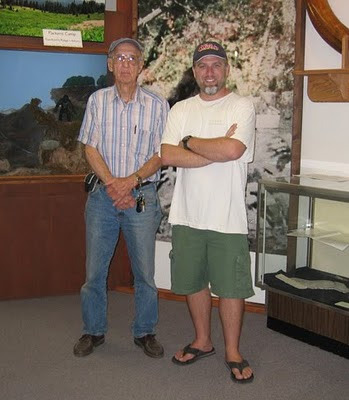 Al Hodgson and Cliff Barackman in the Willow Creek Museum. Mr. Hodgson cast another set of footprints a few months later in Bluff Creek a short distance upstream from where Notice Creek flows into it. He has worked with the likes of John Green, Rene Dahinden, Bob Titmus, Tom Slick, Roger Patterson, Betty Allen, Peter Byrne, and more. He still gets calls to investigate prints and sightings around Willow Creek to this day. A man with this level of experience in the history of bigfooting is a resource whose value is beyond words. As the first generation of bigfooters slowly departs to a place beyond where we can track them, it is becoming of the utmost importance to ask them about the early days of our hobby. This is especially true in the light of recent theories about the PG film. Only those who were actually involved in the bigfooting of the early days will be able to soundly refute the unfounded rumors spread on the internet by various inhabitants of Bigfootland. Steven Streufert, owner of Willow Creek's Bigfoot Books, recently sat down to talk with Al Hodgson and recorded the entire 2+ hour interview. He is now busy transcribing it in its entirety, but has released the first of three installments on his own blog. Please take the time to read the interview.